Why Hire The Sallie Chester Team? 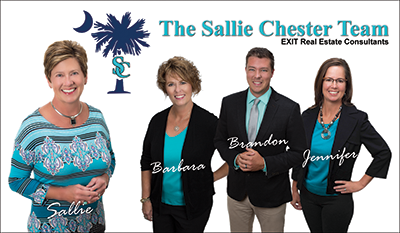 Why should you hire the Sallie Chester Team for your real estate needs in Lexington, SC or Lake Murray, SC? In the 1990’s, REALTOR teams began to form and compete with traditional individual real estate agents. As a result, consumers have a choice between working with a stand-alone agent, or with a REALTOR team. The Sallie Chester Team leverages the experience and knowledge of more than one real estate brain. This helps us to work with clients toward a common goal, offering a broader level of service and expertise than an individual agent. For the midlands area of SC,there are 489 companies in the Consolidated Multiple Listing Service with EXIT Real Estate Consultants ranking #5 for 2017. There are 3,300 agents in the CMLS and Sallie Chester is #156, ranking in the top 5%. There are 60 agents at EXIT Real Estate Consultants in Lexington SC. Sallie Chester of The Sallie Chester Team finished 2017 as the #1 agent for EXIT REC for the 8th time out of the last nine years. Of of all EXIT offices in South Carolina, she ranked #2 in sales volume and #3 for closed transactions. Sallie earned the Sapphire Award from Exit Realty Corp International for having accumulated over 250 closed transactions since joining EXIT. She is a 2017 Platinum Level Recipient and life member of The Central Carolina REALTORS’ Association Circle of Excellence. Take advantage of collaboration, availibility, combined experience and real estate wisdom. We offer full service with a proven track record of success. Hire The Sallie Chester Team for everything real estate!